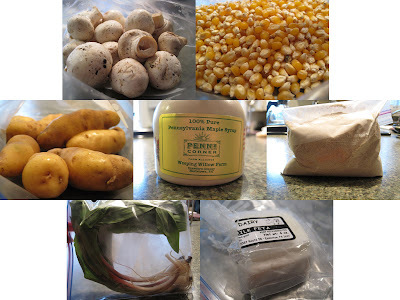 This week's CSA was a little more exciting than usual because we received some 'never before received' CSA items. This is our 3rd year as a member of Penns Corner CSA and for the first time we received popcorn, whole wheat flour, and maple syrup. We also received banana fingerling potatoes, ramps, crimini mushrooms, and goat milk feta cheese. I have an intense craving for brunch on Sunday - French toast with that syrup. An afternoon snack of popcorn. And dinner, maybe a lamb burger with mushrooms and feta. We'll see if any of that happens in the kitchen this coming weekend! Just a quick note: this year we are splitting a share with one of SP's co-workers. Their workplace is a pick up location, so the share is split at work this year. The past two years, we've split everything at home after taking photos. So the quantity may look smaller this year in the photos and that's just because this year's photos are only half of the box! Your CSA goodies look especially great this week. I'm still crossing my fingers hoping for a subscription spot with Garfield Community Farms. If they don't take us, Penn's Corner might be my next option. They even have pick up in Dormont now, and judging by the quality and quantity of stuff you guys get in your subscription each week, I'll probably be more than satisfied.